I have liked everything Helen Humphreys has written and this novel was no different. An English airman is shot down on his first mission and sent to a German POW camp. To bide his time, he studies a family of birds and writes to his wife to whom he was only recently married. The young wife lives in the country and experiences new freedom as she ponders her fate and her fortune. Meanwhile, the airman’s sister is bombed out of her London apartment and goes to the country to stay with his sister in law. The book is barely 200 pages yet filled with emotion. I really liked this! Helen Humphreys' novels include several New York Times Notable Books of the Year. Among other awards, she has received the Lambda Prize for fiction and was longlisted for the Dublin Impac. She has written four books of poetry, six novels, and two works of creative non-fiction. 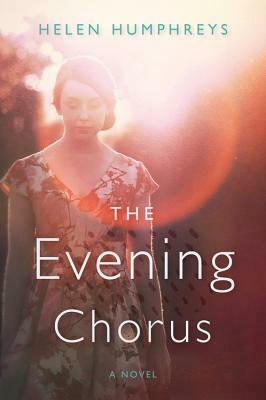 "The Evening Chorus deserves a special place on your reading list this winter." "Scintillating...What Humphreys does so well, in beautiful, precise prose, is convey the shock of that violence, how it rends the everyday. I am very glad to have spent some of my moments on earth reading The Evening Chorus. I reached the end with a sense of wonder that so much life and pain and beauty could be contained in so few pages." "Humphreys (Nocturne, 2013, etc.) offers a heartbreaking yet redemptive story about loss and survival...Humphreys deserves more recognition for the emotional intensity and evocative lyricism of her seemingly straightforward prose and for her ability to quietly squirrel her way into the reader’s heart." "Like birds thrown off course by severe storms, James, Rose, and Enid all emerge from the war in places far different from where they started. Inspired by the resiliency of the natural world, Humphreys (Coventry, 2009) creates a narrative arc that is compact and sinewy, yet from her spare prose and refined imagery springs an arresting novel of regret, contrition, and redemption that glimmers with transcendent moments of hope and valor.Aningeniously elegant and instinctively restrained tale about the durability of the human spirit." "A lyrical novel about loss, love and the natural world." "Award winning Canadian author Helen Humphreys' latest novel is a beautifully written exploration of the impact of war and peace on her four central characters...They all discover that, paradoxically, war brings unexpected freedom, which peace will eventually destroy." "Humphreys' prose is nuanced and deceptively plainspoken; under its simplicity lies profound observation of human emotion." "Poignantly explores the sorrows of war and consolations of nature … A story of heartbreak and hope, it unfolds against a mesmerizingly described natural world." "Absorbing, richly characterized, and marked by smart, delightful twists and turns, the novel’s fruitful visitation of war and its aftermath never fails to captivate. If there is such a thing as a cultural vocabulary of war, Humphreys adds welcome new words to it...In highlighting the wondrous (if at times vexing) unknowability of our lives — that a sudden impulsive idea, or a decision to turn left instead of right, can usher in unforeseeable consequences — The Evening Chorus artfully imagines how that might play out for one quartet. And with her usual faultless eloquence, Helen Humphreys makes our witnessing of their causes and effects memorably instructive." "The Evening Chorus serenades people brutally marked by war, yet enduring to live - and relish - the tiny pleasures of another day. With her trademark prose - exquisitely limpid - Humphreys convinces us of the birdlike strength of the powerless." "Hauntingly beautiful, and highly thought provoking...Beautiful on every page." "Humphreys is a masterful writer; her prose is quiet and simple yet devastating and perfect." "Humphreys is an extraordinary prose stylist...I marveled at every sentence of The Evening Chorus." "This is such a beautiful story and elegantly told."